Today’s interlude was inspired in an unlikely situation. I was at my morning workout with some buddies and we always end this workout with a “COT” – Circle of Trust. During this time, after brief announcements, we ask for prayer requests and then the leader for the day finishes with a quick prayer. My friend’s prayer was motivating. Our government here in the United States has been shut down for over a month. Hundreds of thousands of federal workers are without their pay. Our Congress and President have such terrible strife, division, and enmity, that nothing is being accomplished. I suppose my disgust for this situation has blinded me to the reality that we are called to pray for our leaders – those in authority over us, our governing officials, and all of our fellow mankind. During the prayer, my friend did not pray for any political party to win. He did not pray against anyone. He simply asked for God to bring peace into the situation so that the conflicts could be resolved. I was convicted deeply because although I’ve prayed for people who have been impacted by this situation, I haven’t really prayed for the leaders. I had lost hope and forgotten about the charge we have to pray for them. After being inspired by this prayer, I personally repented of my failure to be praying for my governing officials and those in authority over me. I came into my studio and created this musical interlude and companion video to inspire people everywhere to join in prayer for our leaders and all of our fellow man. Perhaps you are not a person of faith. Although my own motivation and passion for this music comes from deep within my own Christian faith, I believe that you can still benefit greatly from listening to this music. Be still. Express gratitude for your many blessings. Consider how you might love others more deeply and bring value to their lives. For those of us who are of faith, take time and pray. Pray for peace. Pray for unity. Pray for progress. In your prayer, do not cast judgment; rather, proclaim grace and mercy. Our divided government faces a huge mountain … an obstacle of hate, division, envy, and discord. Proclaim grace to this mountain and let us wait to see resolutions. From time to time I like to share a bit of the recording process and the sounds I use. For those who are frequent listeners of the Worship Interludes Podcast, you will quickly recognize that the instrumentation on this interlude is unique. For this piece, I experimented with my own custom combination of sounds in the sound library “Keyscape” by Spectrasonics. This particular sound is the combination of a custom-modified, 7’6″ Yamaha C7 Grand Piano and a rare, turn-of-the-20th-Century Wing Upright piano with its Tremolo attachment engaged. Using my Yamaha S80 controller, I was able to fade the upright tremolo in and out as desired. The sound is haunting and sets the tension in the music for intercession and prayer during dark, troubling times. For the video, I wanted to have imagery of candles and smoke. 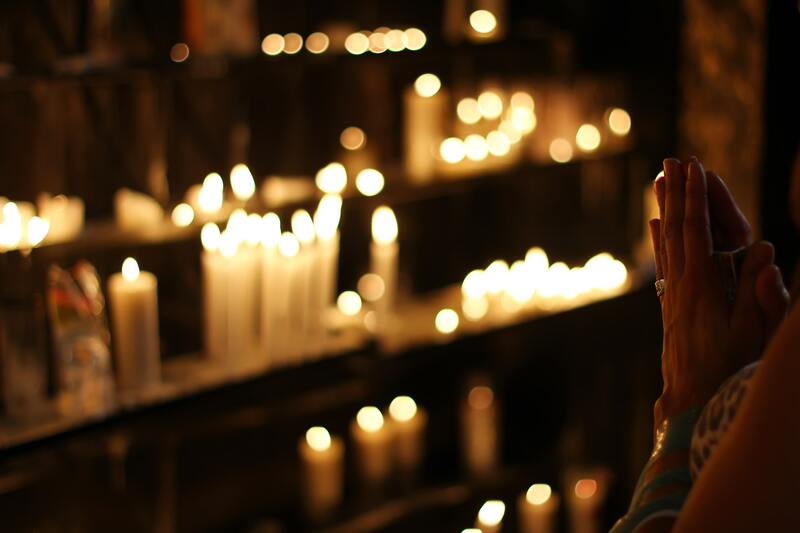 Lighting candles for prayers is a tradition that takes us back many centuries. Although there is no special spiritual reaction to lighting a candle, it’s meant to be a symbolic action of our lighting the fire and releasing it to burn. As fire traditionally represents the Holy Spirit in the Bible, smoke is often symbolic of God’s Presence. I’m also fond of any videos of waterfalls, rivers, and flowing water. I hope that you enjoy this composition. I hope that the tone translates the tension of the time and that it pushes you to pray and intercede for those in authority, our leaders, our loved ones, and all of our fellow man.